Abridged translations of Homer’s Iliad and Odyssey, The Homeric Hymn to Hermes, and Plutarch’s Life of Tiberius Gracchus. 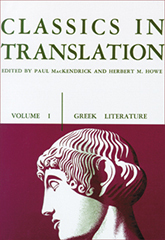 Selections from Hesiod and Lucian; from twenty-eight lyric poets including Sappho, Pindar, and Meleagar; from the histories of Herodotus and Thucydides; and from eight Attic orators, including Isocrates and Demosthenes. Selections from the scientific writings of Hippocrates, Archimedes, and Galen. Selections from the pre-Socratic philosophers and from Plato, Aristotle, Epicurus, and Epictetus.